Railpictures.ca - Robert Farkas Photo: On my first trip to Toronto by myself, my dad loaned me his Nikon and let me use whatever film was in his camera bag. This was from a roll of color print film, so it is not Kodachrome quality. CN 6793 sits outside the Toronto Union Station train shed on a warm mid-June 1972 day. (The photo date given above is approximate.) Soon she would be heading west. | Railpictures.ca – Canadian Railway Photography – photographie ferroviaire Canadienne. Caption: On my first trip to Toronto by myself, my dad loaned me his Nikon and let me use whatever film was in his camera bag. This was from a roll of color print film, so it is not Kodachrome quality. 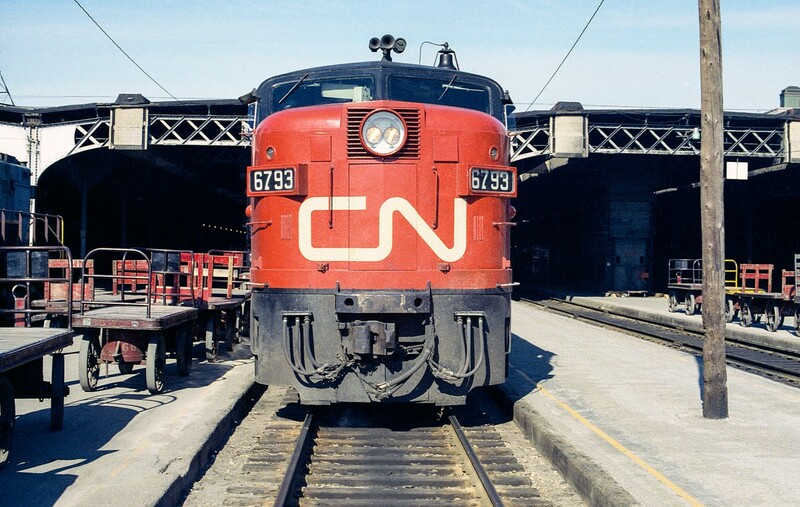 CN 6793 sits outside the Toronto Union Station train shed on a warm mid-June 1972 day. (The photo date given above is approximate.) Soon she would be heading west. If you took this picture nowadays you’d likely end up in jail. No Snake..long story, but taking the summer off and will start in the fall. Phil- have you started on Via yet ? Agreed. The PA’s were the most beautiful passenger units ever built (too bad the demonstrators on CN never came to an order) followed by the FA’s. The ALCO cabs were the most beautiful Diesel locomotives ever built. Thanks to VIA and the LIRR, a fair representation of the FA type remain today. Really nice photo! The most beautiful passenger locomotives ever to run in Canada.